38 • RV PRO • March 2019 rv-pro.com S P E C I A L S E C T I O N – R V X P R E V I E W Kyle Bonita National Sales Manager, Torklift International During Kyle Bonita's five-year journey at Torklift, which began in the manufacturing unit, he has since excelled through the customer ser- vice department and onto the sales team because of his winning-oriented attitude. "Knowing that my journey has just begun is what gets me going," Bonita says. "There is so much to learn and so many relationships to build. I'm a sponge, but I have also had the leeway to pave a path here. One day in return, I hope to be the person that can help others join me on my path." Larry Besse Primeaux RV Larry Besse began his career in the RV industry by accepting a part-time job with the parts department of Stevens RV in 2004. While finishing his under- graduate and MBA, he transi- tioned through several depart- ments, learning the business before ultimately becoming the general manager. He has been with Primeaux RV for the past four years serving as the general manager and couldn't imagine being anywhere else. Besse says, "Some of my fondest childhood memories were camping with my family, and now I have the opportunity to help thousands of families re-connect and create lasting memories." Bryan Melton General Manager Travel Trailers, Airstream Throughout Bryan Melton's career, he has combined his adventurous spirit with his pro- fessional career. His purchase of a new Airstream in southern, Calif., in 2007 immediately immersed his family into the brand and lifestyle. He wasn't aware of it at the time, but this was the start of his path toward working at Airstream. He accepted the position of gen- eral manager, travel trailers at Airstream in late 2014. Prior to Airstream, he held successful executive positions within the cycling industry. "I am hon- ored to be presented this prestigious award," Melton says, "and to be a part of this incredible industry." 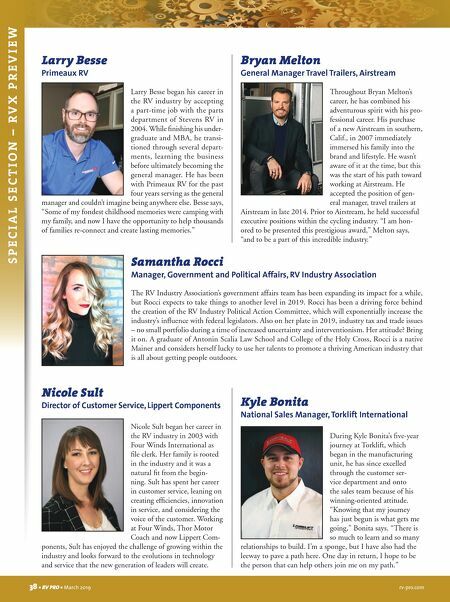 Samantha Rocci Manager, Government and Political Affairs, RV Industry Association The RV Industry Association's government affairs team has been expanding its impact for a while, but Rocci expects to take things to another level in 2019. Rocci has been a driving force behind the creation of the RV Industry Political Action Committee, which will exponentially increase the industry's influence with federal legislators. Also on her plate in 2019, industry tax and trade issues – no small portfolio during a time of increased uncertainty and interventionism. Her attitude? Bring it on. A graduate of Antonin Scalia Law School and College of the Holy Cross, Rocci is a native Mainer and considers herself lucky to use her talents to promote a thriving American industry that is all about getting people outdoors. Nicole Sult Director of Customer Service, Lippert Components Nicole Sult began her career in the RV industry in 2003 with Four Winds International as file clerk. Her family is rooted in the industry and it was a natural fit from the begin- ning. Sult has spent her career in customer service, leaning on creating efficiencies, innovation in service, and considering the voice of the customer. 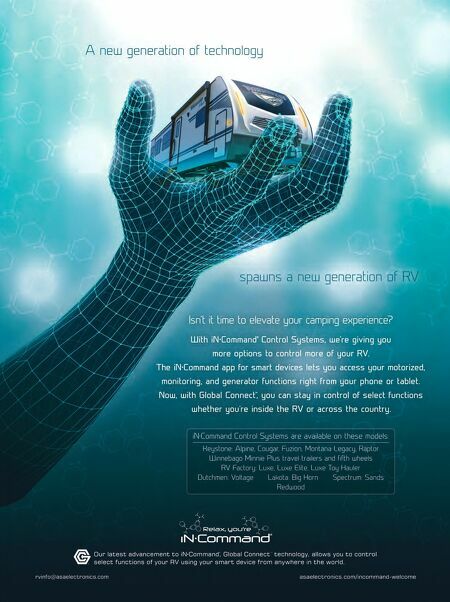 Working at Four Winds, Thor Motor Coach and now Lippert Com- ponents, Sult has enjoyed the challenge of growing within the industry and looks forward to the evolutions in technology and service that the new generation of leaders will create.